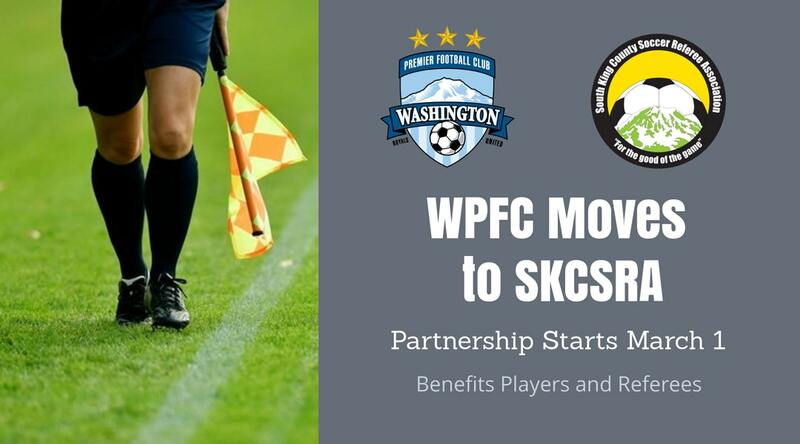 Effective March 1, 2018, Washington Premier Football Club will transition from Pierce County Soccer Referee Association (PCRSA) and will begin a new partnership South King County Soccer Referee Association (SKCSRA) for our referees. This move is being made for a number of business reasons. First, this past fall season, about 70% of WPFC games had the appropriate level of referee coverage. This is an unacceptable level, while our peer Pac NW experienced almost 100% coverage through the use of SKCSRA. While referee pools continue to shrink statewide, the numbers appear to be dropping faster in PCRSA. Secondly, in moving to SKCSRA, WPFC’s match fees will be competitive with other clubs in the area. SKCSRA’s programs will help to recruit more referees as well as providing mentoring to improve the officiating expertise for WPFC games. With improved recruitment and retention, SKCSRA will provide better referee coverage for WPFC. By establishing a partnership with SKCSRA, WPFC will now have access to over 1,500 registered game officials. This transition should be totally transparent to our membership. We wanted to share this information with you so that you know the club’s soccer leadership is addressing the playing environment of our games to ensure that the experience is the best it can be. You may see some new faces at our games and we ask if you are passionate about the game of soccer, help us build an atmosphere of respect for our youth and our referees that promotes the positive aspects of the game of soccer.